The commercial modular or prefabricated construction market has been considered a growth opportunity for the construction industry by FMI Corporation, the largest provider of management consulting, investment banking and research to the engineering and construction industry. According to FMI's fourth quarter 2010 NRCI report, more contractors are thinking lean and looking for ways to build for less. The recession and new technologies are set to increase the use of manufacturing process and environments for construction. The NRCI report indicates that prefabricated construction is becoming more popular due to the growing use of BIM and owners wanting projects faster and for lower cost, safety, quality and the shortage of skilled labor once markets return to more normal growth. 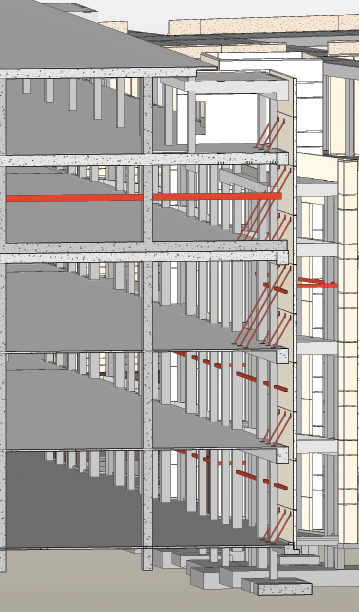 Watch our Video BIM Fly-through on St. Joseph's Women's Hospital in Tampa, FL. Prefabricated precast concrete systems offer sustainable, efficient building practices. A revolutionary transition from traditional hand-set masonry construction to Brick Inlaid Precast Concrete Exterior Panels are rapidly becoming the preferred building choice among architects, contractors and owners. The panels are manufactured in a controlled plant environment where many features can be added such as encapsulated insulation which offers higher R-Values, electrical boxes and wiring, and paintable troweled finish interior walls, which eliminates the need for metal studs and sheet rock. The integration of windows into panels is an innovation in precast that is in its infancy but sure to be in high demand once markets gain momentum. Among the many benefits, this prefabricated, unitized system offers accelerated occupancy, and less jobsite disturbance with the reduction of a trade. Owners have more than two years' worth of pent-up demand for design services. Bring Gate Precast into the design and construction process in the early stages of your new projects to provide input and offer value engineering suggestions to maximize precast concrete's many benefits on your complete structure. Woodlawn Elementary School, OH: Exterior features a pre-insulated load-bearing, non-composite brick inlay architectural precast wall system. NAS Fitness Facility & Rescue Swimmers School, Pensacola, FL: Features a total precast building system that is designed to withstand both external (hurricanes) and interior (indoor pool moisture) elements. CitiGroup Citi Center, Jacksonville, FL: The exterior of the five-buildings in the 530,000 sq. ft. campus features 15'x32' solid precast concrete panels which met the structural integrity requirements for a hurricane zone and an aggressive construction schedule. US demand for precast concrete products is forecast to rise 6.1 percent annually to $11.3 billion in 2015. 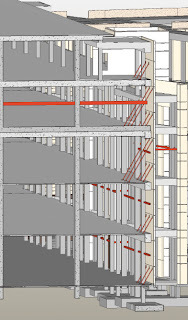 This is a blue print that is surely to be a standard to be implemented in building construction. Engineering this model makes construction much faster. The engineer made this blueprint is awesome! there such balance on the building it self.